Andrea and Irene started reading together this year. This is Andrea James’ second year as a reading mentor with Read Ahead at PS 397: The Spruce Street School. She is an Executive Assistant at WilmerHale. This year Andrea has been reading with Irene—she constantly adapts her approach and comes up with creative ways to help Irene learn to read and become fully literate in the English language. Read more about Andrea’s Read Ahead experiences below. I thought it was a good idea to reach out to children and help them start enjoying reading and learning how to read. I really think reading is something that is important for every child. All of my aunts and my mother read to me. They just read everything. They were from the islands and reading was important to them. So of course they would read to me and my sister at night. It was something that was enjoyable—it was memorable. As I got older I learned to read with my inside voice instead of reading out loud and I enjoyed it even more of course, because it would allow my imagination to take over. You’ve read with two different students in the Read Ahead program. What was your experience like with your student last year? I had a student who was a really good reader for her age. When I would come in for the reading sessions, she would always want to read to me. She would pick books that I found very interesting—she chose a book about Benjamin Franklin, so it was also educational for me! Tell us about your relationship with your current student, Irene, who is an English language learner. Every week for the past three weeks, I would come in and she would say, “I don’t know how to read—you read to me!” My strategy with her was to write down the names of the books and have her read me the letters as I’m writing. And I had her count the pages and then say the name of the book. I would get her engaged in each book little by little, by asking her what she thought would happen next. 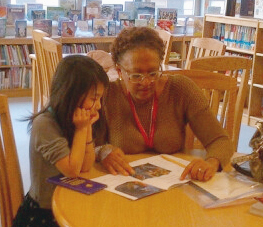 What is the most rewarding part of being a reading mentor? It’s nice to see when the session is ended, and when the year has ended, how far the student has come. And it would be really nice for me if at the end of the year she could read a little to me. I’d be very happy. And I think she will.